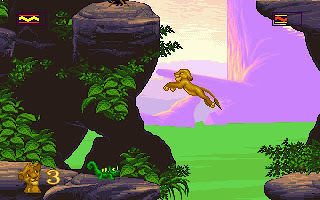 The Lion King is a platform game based on 1994 Walt Disney's The Lion King animation feature film. Though it is based on an film, it is by far one of the best platform game around for that time. The 256-color VGA graphics is superbly used. The character movement is smooth, the background scene is beautifully arranged, and the color scheme is as striking as the film it self. Besides superb graphics, the digitized soundtrack extracted from the film is very nice too. It's very rare for a game to have such high quality soundtrack in year 1994. There are 10 level in The Lion King. 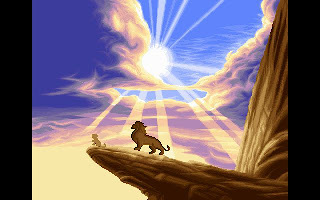 We will play as the young Simba for the first 6 levels, and play as the adult Simba at the last 4 levels. 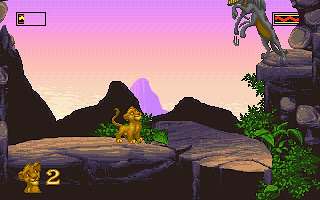 In Lion King, our main objective is to get pass the level by jumping over obstacles and hit the enemies by jumping onto them. There are some parts that need some puzzle solving too. 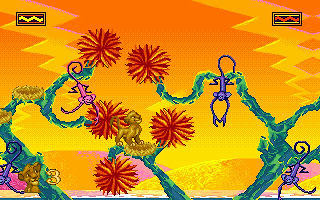 Like in Level 2, we need to shout at the monkeys so that they will throw us in the right direction. On many occasions, we need to act accurately to get pass. Don't under estimate The Lion King and thinking that it is a game for kids. A lot of practice is required to beat the game. No matter how skillful are you, you won't be able to get pass many levels on the first time you play, even using the Easy difficulty setting. 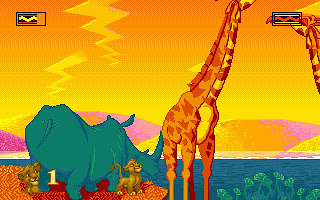 You can download Lion King here.